What is a fuel-cell powered car? how does that work? what is this? Pakistan Zindabad nonetheless. But don’t worry, we’ll tell you all about it. Fuel-cell is a chamber(Device), where you pass few chemicals from one side of the chamber, and you get electric current from the other side through a chemical reaction which occurs inside the chamber with the help of the chamber’s walls; anode(negative) and cathode(positive). A fuel cell does not expire like a battery, but it does need constant supply of fuel and an oxidant to keep it running. The most popular fuel and oxidant used to trigger the reaction in the chamber is Hydrogen-gas and oxygen. Batteries are used to start the Fuel-Cell system that takes around 15-20 secs to start producing power. The system gets its oxygen from the air. 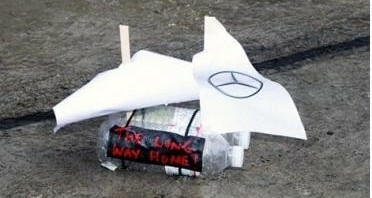 That would be it for the science class, now onto the car which a team from N.E.D University built, and managed to have it flown to Malaysia to participate in Shell ECO Marathon 2010. Trike as the team named it, is nothing short of a remarkable achievement by few university students when our Automobile Industry can’t even manufacture a car, these students took the world head on by assembling and designing their own. Construction of car : Mild steel(chassis) & Aluminum+Fiber reinforced plastic body. Power generated by Fuel-Cell System : 1KWatt. 40volts and 26 amp. Temperature Control : Automatic i.e built in in FC system. operating range : Any normal condition (Winter + summer). On-board Hydrogen capacity : 375 liter of hydrogen at 139bar. Type of storage of Hydrogen : Aluminum Cylinder. Liquid or Compressed or Gel absorbed : none. Weight of Car : 125kg w/o driver. Load capacity of car : One person. Temp range over which it can function : Its has its own cooling system that control its temperature and can operate under any normal condition, winter and summer both. Will it overheat in Pakistani temps? : No, Fuel-cell’s maximum efficiency is attained in hot and humid environment. Mileage : 1333Km/Kg of hydrogen. Efficiency : About 50% which is very high as compare to 15~35% of normal IC Engines. Super Capacitor : 650farad each cell and 10 cell in series makes 65 farad , 27 volts. The R&D and fabrication of the car was supported by Hino-Pak. The CAD Model was developed by the team itself, used some FEM software to check the car’s strength. The team discussed the computer generated result with the Hino-Pak’s R&D Team and began fabricating once Hino-Pak’s R&D Team approved it. NED provided Hydrogen powered Fuel Cell that was used in the car after extensive research of more then 4 months. Thal Engineering financed the team so they can buy few items from abroad like Super Capacitors and flow meters, etc. Super Capacitors were used for the first time in Pakistan on Trike. 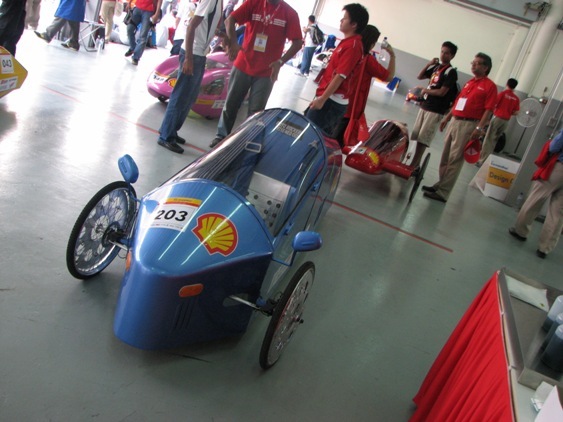 Testing of the car was done on Hydrogen Gas provided by BOC Pakistan along the tickets to Malaysia for Shell ECO Marathon 2010. NED Alumni Association of Southern California, USA also contributed financially to the project. As I inquired more about the details from the team about the R&D through this project and how can it be put to further use, especially; how can Pakistan benefit from your project and research, Khurram, who is the team manager says,”The items team brought in from abroad to use in the car are universal and can be used on different projects as well”. Khurram also said,”This project shows that the latest Fuel Cell technology is not difficult to be used in cars but we need investment and R&D. As you can search that Fuel-Cell technology is taking the attention of most of the countries as well as known Auto Manufactures are seriously working on its development”. So whats the future of this technology in Pakistan? Khurram says,”The car is a Prototype and as per technology, Hydrogen is very cheap as compare to other fossil fuels (that adds pollution as well as high-costs). Where as, if we use Hydrogen Fuel Cell it will emit Pure Water from the exhaust, and also its efficiency is far more better than the Internal Combustion Engines. This can be used to produce cheap Electricity”. But we all know, the car will be dismantled soon and the parts will be put to different research projects and nothing substantial would be achieved from this project as our Auto Industry runs for profit’s sake, not development. The team members are planning to go deeper in this technology but they would like to taste professional life first. Good Luck! VERY GOOD EFFORT FRIENDS I ALSO INTERESTING IN THIS TYPES INVENTION. I HAVE SOME PLANS FOR FUTURE I WILL DONE IT AFTER FEW MONTH. IN MY PROJECT WE CAN EASILY MAKE HYDROGEN IN HOME FREE COST AND FILL CYLINDER AND THEN USE IT IN FUEL CELL. FOR MY HELP CAN YOU YOU REPLY ME ON MY E-MAIL.